The user’s Google Account authentication credentials (login, password, and second authentication factor if 2FA is enabled). The ability to receive a verification code from WhatsApp (e.g. with the user’s SIM card). The Android version of WhatsApp can back up its communication history into the user’s Google Account, particularly the Google Drive. While WhatsApp does not encrypt media files (pictures and videos) sent and received by its users (making it possible for Elcomsoft Explorer for WhatsApp to extract them even without the cryptographic key), the main communication history, the actual messages, is securely encrypted with an AES-256 based encryption algorithm. The exact algorithm depends on the version of WhatsApp, but one thing is for certain: it simply isn’t possible to decrypt the data without the key. 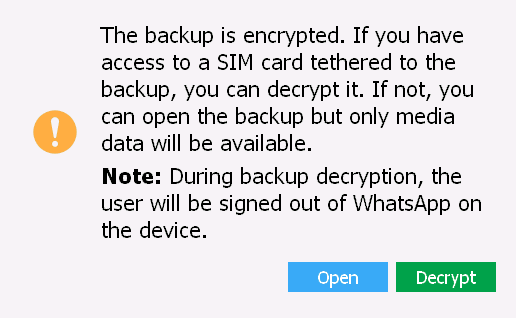 The encryption/decryption key is generated by WhatsApp servers the first time the user makes a backup. The key is never stored in the cloud; instead, it is only kept on the device. Whether or not the key can be extracted from the device depends on the version of Android and device’s root status; we won’t touch this issue here and point you to this article instead. Permanent decryption key: The decryption key received by Elcomsoft Explorer for WhatsApp is permanent and does not change if the user changes their Google Account password. 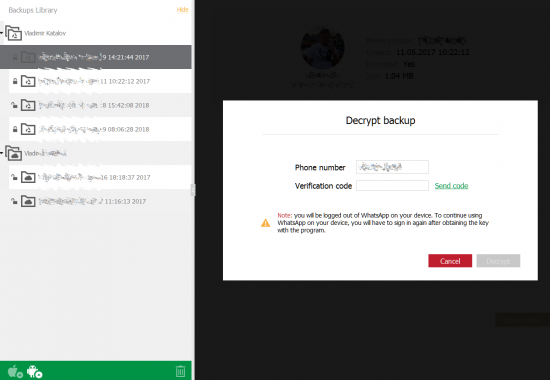 The decryption key remains valid even after re-authenticating WhatsApp on a different device provided that the the same phone number and Google Account are used. The same key can be used to decrypt older backups created before the key was retrieved. 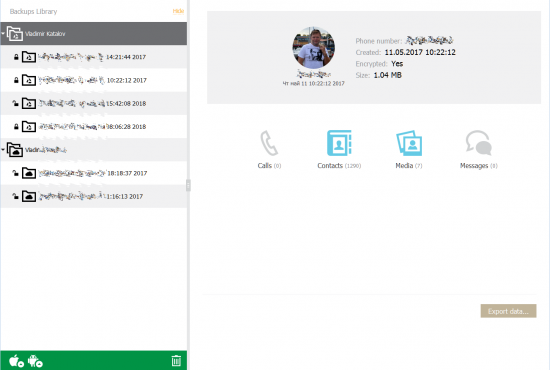 In order to generate the cryptographic key, Elcomsoft Explorer for WhatsApp attempts to register itself as a WhatsApp application. Once the tool sends the authentication request to the WhatsApp server, the server sends a verification code to the user’s registered phone number. This code must be entered to Elcomsoft Explorer for WhatsApp in order to generate the cryptographic key. Note: Since WhatsApp is restricted to only running on a single device, receiving an authentication key deactivates the user’s existing WhatsApp instance. The user’s Android phone will no longer be able to send or receive WhatsApp messages after transferring WhatsApp registration to Elcomsoft Explorer for WhatsApp unless the user re-authenticates it again on their device. However, even after re-authentication, the cryptographic key will remain valid and usable. Follow these steps to extract a WhatsApp backup from the user’s Google Account. Launch Elcomsoft Explorer for WhatsApp. Click on the green Android icon again. 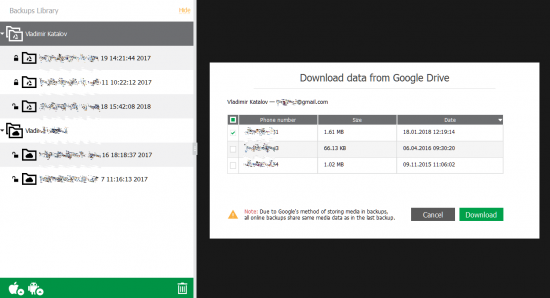 Select “Download data from Google Drive” from the menu. Note: you will not have to repeat the authentication process as Elcomsoft Explorer for WhatsApp will use cached credentials from the previous steps. If the user’s Google Account has two-factor authentication, you will be prompted for a code. If you attempt to access encrypted data, you will be prompted for a WhatsApp verification code. Click Send to request a code. The code will be delivered to the phone number. Enter the code into the “Verification code” box. WhatsApp remains one of the most reliable instant messaging services. Based on Whisper Systems communication protocols, its point-to-point communications remain securely protected even if someone manages to intercept them. Cloud backups remain one of the few vectors of attack allowing to remotely access WhatsApp communication history. If you have cloud backups enabled in WhatsApp and your phone is suddenly deregistered from your WhatsApp account, watch out as someone could have accessed your data. As always, we recommend activating two-factor authentication to protect your Google Account. This entry was posted on Wednesday, January 24th, 2018 at 11:59 am	and is filed under Elcom-News, Software. You can follow any responses to this entry through the RSS 2.0 feed. Both comments and pings are currently closed.